Fleetwood says, "If your outdoor lifestyle takes you where roads don’t go and trails end, our Evolution series recreation support vehicles are built to get you and your gear where you want to go. And since you play as hard as you work, you’ll appreciate the amenities you’ll need to comfort your weary body." We agree! So why not do it in style? Your rental will include; beds, shower, stove, hot water, awning,chairs, etc. This outfit will give you everything you need to get into, and stay in a good area. This isn't one of those "small tire" wimpy rigs, no, this is the cadillac of pop-ups! 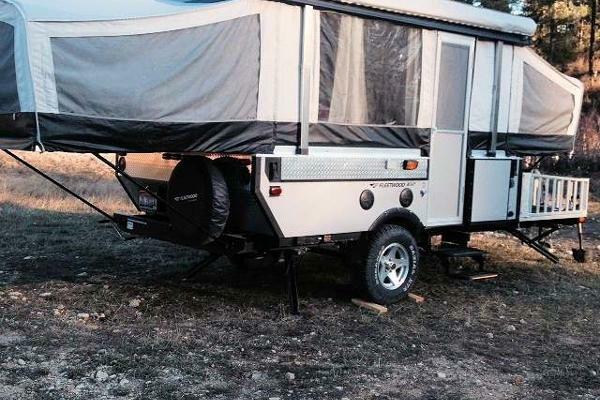 With large offroad tires, and extra clearance, this trailer will handle most two tracks! Why waste vacation time being miserable, make your deposit today! The trailer will have many of the necessary items, pots/pans, cooking utensils, kitchen towels, foldout chairs, etc. All you wil need is your vehicle (and insurance waiver), weapons, gear, clothes, and food! We provide you with 2 full propane tanks (20 lb). The deposit on trailer is $500 towards damage, cleaning, and insurance deductible. In the event of a cancelation, we will keep $100 of the deposit, if cancelation is made 7 days before rental, cancelation will be $200. This is because the rental takes place during a small window of time when we can rent the trailer, and we may or may not be able to rent it again. The $500 will be refunded when the trailer is returned clean, damage free, and with propane (in the event you can not do this, we will fill up for $25/canister). A cleaning fee of $100 will be charged in the event it comes back dirty. While you are towing, your auto insurance should cover the rental, you will need to have your INSURANCE AGENT fill out the "trailer rental liability form" BEFORE any rental can take place. ATV's are available as well. Please contact us for pricing and options. Rental forms, liability forms, and pre-check list will be provided before rental. If you would like us to drive the trailer to your destination, or to a meeting place of your choice, we MAY be able to provide this service for $30/hr of drive time, round trip. Same with pickups. Pop up trailer folded down. 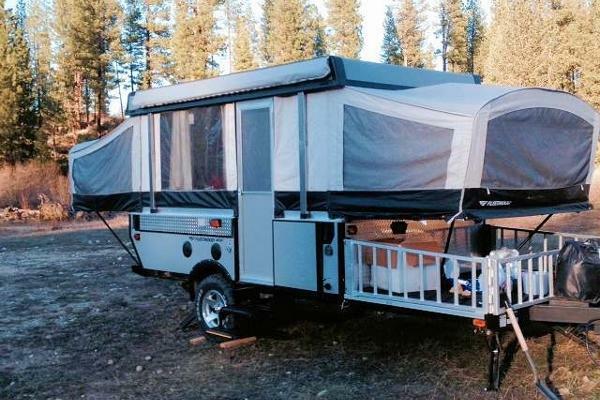 The Evolution folding camping trailer by Fleetwood for all those campsites that can't be found in a campground. You know the ones, off the beaten path where the surrounding trails are loaded with fun! 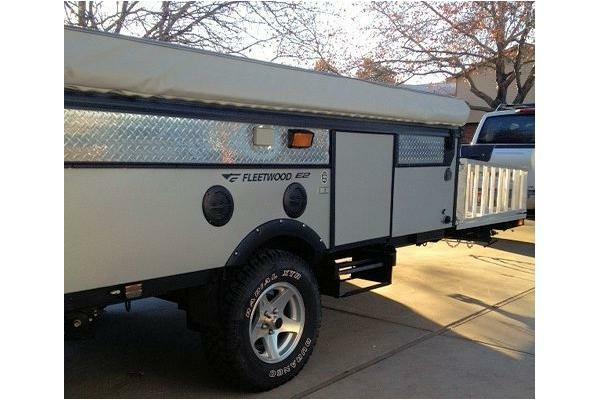 The Fleetwood Evolution series recreation support vehicles are built to get you and your gear where you want to go. And since you play as hard as you work, you'll appreciate the amenities you'll need to comfort your weary body. All models except the Cobalt have a front deck for transporting your gear or motor sports. There are four family friendly floorplans to choose from all quality built for years of enjoyment. Models E2 and E3 feature a deck capable of carrying an ATV of up to 800lbs, and includes an integrated ramp and rail system for convenient loading and unloading. So if you like to camp where all the fun is, then rent today! Our trailer/s come with comprehensive insurance on the trailer with a $1000 deductible. The deductible amount will be your responsibility. This is only during the time it is parked/not hooked to auto. While you are towing, your auto insurance should cover the rental, you will need to have your INSURANCE AGENT fill out the "trailer rental liability form" BEFORE any rental can take place.